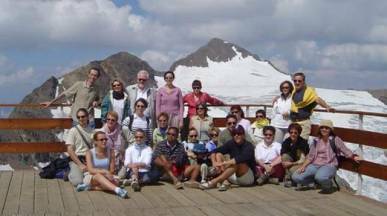 If you’re interested in music and would like to use your holidays in a positive way, the charitable association Notre-Dame des Neiges Organs in the Mountains provides an exceptional setting in the French Alps, the skiing resort of l’Alpe d’Huez, to deepen your knowledge of music in an uncompetitive atmosphere. 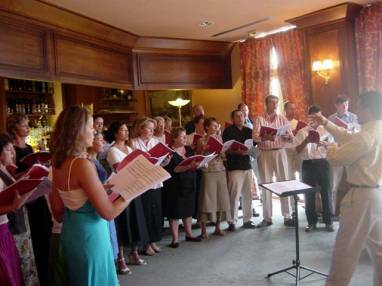 The association Notre-Dame des Neiges – Orgues et Montagnes offers three music courses (church organ, Pan’s pipes and choir singing) in incredible surroundings every summer. At the end of the courses, you will be able to participate in a public concert, given in the church of Notre-Dame des Neiges, a stunning modern building, illuminated by the stained glass windows of the artist Arcabas. The mountain resort of l’Alpe d’Huez offers a wonderful setting for these courses. Whether you wish to spend your free-time doing sport, or simply walking around the area, the sunny climate allows for a maximum of outdoor activities. A system of free pass cards gives you free access to all the leisure possibilities that the resort has to offer. For further details, please visit the web site http://www.alpedhuez.com/. Access to l’Alpe d’Huez is very easy. Only 63 km from Grenoble’s TGV station and airport, there is also a regular bus service between the two towns. T�l. : +33(0)4-76-80-31-61 - http://www.transisere.fr/. 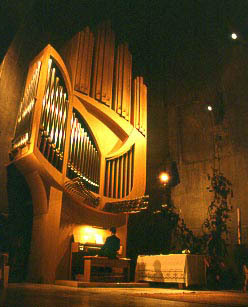 The Notre-Dame des Neiges church organ is one of the finest examples of recent organ making. Designed by Jean Guillou and built by Detlef Kleuker, it has two keyboards of 61 notes each, 32 pedal notes, 24 speaking stops, tracker action with an electronic combination system. Its organ casework, which represents a hand reaching out towards the sky, is world famous. Improve your technical and artistic skills with the help and back-up of an experienced teacher. Individual tutoring (in turns) is from 9 am to 1 pm. 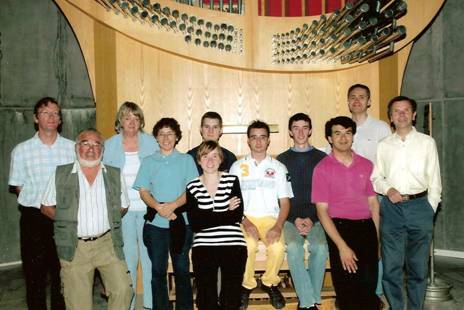 The afternoon is devoted to individual studies on the Kleuker organ of l'Alpe d'Huez, or Schwenkedel organ of Huez. The choice of works that wish to be studied is left entirely to the trainees, whether concerning style or musical difficulty. 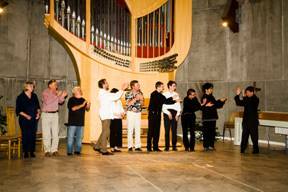 The first week is largely devoted to the elementary study of the organ. Listeners are welcome (12 € per day). You are invited to a concert of organ, violin and Pan’s pipe music given by J.-P. Imbert, C. Ciuca and C Pana. 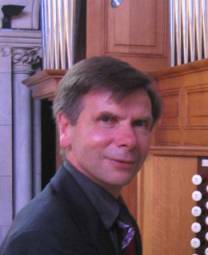 The trainee organ players will give a concert, accompanied by the choir trainees. On Saturdays and Sundays, you are warmly invited to participate in the church services and to share ideas about liturgical presentation. Classes can be run in French, English or German. Discover the unlimited possibilities of the Pan’s pipes, whatever your level of experience (even professional) with world renowned player, Cornel Pana. You can buy your instrument at the end of the course. Private tuition is put at your disposition every day as well as the possibility to share your experience with other people from all over the world. The register ranges from classical music to folk songs. 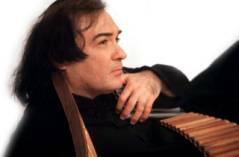 Cornel Pana will write a piece of music for each trainee, according to the level of his mastery of the instrument. You are invited to a trio concert of in which organ, violin and Pan’s pipes accompany each other. A concert of all the organ pupils will be given. Classes can be run in French, Romanian or German. Voir le CV de C. Ciuca. Christian Ciuca (musical direction ) ; Florence Jouars-Brousse and Mathilde Ambrois (vocal technique lessons) ; Gino Montille (piano). A wide variety of composers will be studied (Mozart, Bach, Mendelssohn, Rutter…). 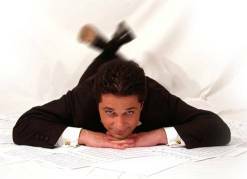 The sheet music will be sent to you beforehand, to enable you to study it in advance. The six hours of daily studies are arranged in a manner to permit participants to profit from all the other activities on offer in the resort. Shared organ pupil’s concert. Classes can be run in French, Romanian, English, German or Dutch. Christian name : ……………………………………………….. Sir name : ……………………………………………….. Profession : ……………………………………………….. Birth date : ………………………………………………..
As places are limited, applications are examined in the order of their arrival. Prices include adherence, teaching fees, fees of organisation and sheet music (for Pan’s pipe and choir singing). Sports access cards and the closing dinner are free. Other meals and hotels are not included in the price. There is the possibility of a small bursary when necessary. Cancellation after 1st July is priced at 30 euros against all refunding. Thanks to Alexander Watson for the translation !